A metal detector is an electronic instrument which detects the presence of metal nearby. There are many makes and models of metal detectors available - finding buried treasure is not as simple as buying the cheapest detector, turning it on, and digging up hidden gold! The question for many hobbyists embarking on their treasure-hunting adventure must be - what is the best metal detector? What Makes A Good Metal Detector? Our pick of the best hobbyist metal detectors available is the Bounty Hunter TK4. It's great value, lightweight, easy to use, with great battery life, but it's still capable of finding a wide range of metal objects. Our runner-up, and our favorite if you're on a budget, is the Bounty Hunter Gold Digger. Despite the name, this detector isn't specifically geared to finding gold - it's suitable for searching for all metallic objects. Our third choice, the INTEY Metal Detector with LCD, gives you a built-in LCD display rather than just alerting using different sounds. The Garrett ACE 200 is slightly more expensive than our other picks, but it's lightweight, comes with an LCD display, and the coil is waterproof. The Bounty Hunter TK4 is tremendous value. You can use it to detect coins, jewelry, survey markers, and many other metal objects. It's lightweight and easy to use, making it ideal for beginners or more experienced users. You won't suffer from fatigue if you plan to use it for several hours at a time. The 2x 9-volt batteries will give you around 15-20 hours of metal detecting if you use headphones. Although Bounty Hunter claim the TK4 can detect objects up to 8" below the ground, for anything smaller than a soda can the practical depth limit seems to be around 4-5". Like most things in life, you get what you pay for, and there are more expensive detectors available which will find small objects at a greater depth. The TK4 is a motion detector. This means that you have to constantly move the search coil over the target area, for the TK4 to find metal objects. If you hold the detector stationary, it will not be able to detect anything. Our main complaint with the TK4 is the lack of discrimination - you'll find quite a few false positives, though no more than you'd expect at this price level. Some of the false positives are caused by striking the ground as you move the detector head, you'll learn to recognize the tone this makes with practice. Although the TK4 is very light, in part this is due to the amount of plastic used in this model. Again no different than what you'd expect at this price point, but it doesn't feel as robust as some more expensive metal detectors. We're disappointed that there's no way to adjust the volume, it wouldn't cost much for the manufacturer to add this feature. The hard-of-hearing should look elsewhere for a detector with adjustable volume. Finally, we're confused by this, but this detector seems to work better with headphones - no idea why this would be the case, but back-to-back testing with and without headphones confirms it to be true. Who Are Bounty Hunter Detectors? Bounty Hunter are a division of First Texas Products, an American company founded in 1999, and based in El Paso, TX. They also own Teknetics (metal detectors) and other product lines. 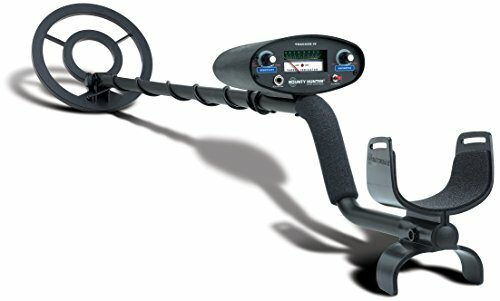 Bounty Hunter back this metal detector with a 5 year warranty. 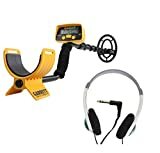 The Bounty Hunter Gold Digger Metal Detector can be applied in searching through the beach, park or backyard for all types of valuable metals ranging from gold coins to iron relics. It can detect coin-sized and larger objects up to six inches and two feet respectively thus becoming our #1. Its greatest feature is the motion all-metal mode together with the trash elimination control. 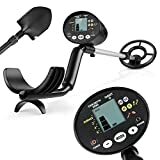 Other features consist of headphones and jack for privacy, automatic tuning and ground balance, sensitivity and power control and treasure meter. This detector can tell you the approximate depth of whatever buried metal you have detected. Its party piece is high accuracy - it can show you whether the buried metal is silver / copper / aluminum or zinc before you go to the trouble of digging it up. The search coil is waterproof, and the manufacturer backs this detector with a 2 year warranty. Assembly is straightforward, you should be up and running in under 5 minutes. It is powered by a single 9 volt battery. New features for this year include Target ID and improved audio. The 200 model also comes with a waterproof coil and includes headphones & batteries. 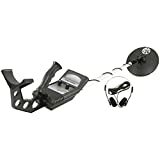 Start Your Treasure Hunt:This is a must have metal detector kit for adults ,kids,beginners, to start a new hobby,as bounty hunter great idea choice treasure hunting gear. 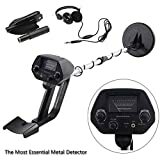 This entry-level metal detector provides a great introduction to the hobby. While it is not going to be as powerful or sensitive as models costing 10x as much, it's more than capable of finding buried treasure for you. It requires 2x 6-volt batteries, and can detect coins up to 4" away. Your budget will go a long way to determining which detector you buy. There's a lot of advice out there telling you anything below $150 / $300 / etc. is just a toy for kids, however there are reasonably-priced detectors available which are more than capable of discovering their own value in coins & jewelry in a short time. Like most things in life, you get what you pay for, and more expensive detectors will tend to come with extra features and better performance. If you're looking for a detector to use on an occasional trip to the beach, there's no point spending $1800 or more for a professional-grade Minelab detector. However, if you plan to use your new metal detector frequently, or even make a career of it, it's worth looking at a higher-end model. If you plan to use your detector in the wet sand at the beach, or in other areas containing water, you'll need a specific type of detector (either "multi-frequency" or "pulse induction"). The cheaper metal detectors use a single frequency, and will become confused by the moisture, returning so many false positives that they will be useless. In addition, you'll need a device that is both salt- and water-proof. Protecting against salt and water adds a lot to the cost of manufacture, which is reflected in the price - you won't find a detector priced under a few hundred dollars that's truly suitable for the wet sand at the beach. Lower-end detectors are still capable of being used in the dry part of the beach. If you're an experienced user, you may be looking for specific features that are only available in more expensive metal detectors. However, if this model is to be used by a beginner (adult or child), it may be better to start out with a budget model, until you're sure you want to commit to this hobby. Some of the cheaper models are still useful as a back-up detector, even if you become a more serious treasure hunter. What Metals Are You Looking For? If you put a gold nugget directly under a $100 machine and a $1000 machine, they will both detect it. The difference is how far below the surface it will detect the nugget, how small a nugget it will detect, and how well it rejects false positives (such as old nails, beer cans, or even other minerals contained in rocky ground). If you are specifically looking for gold nuggets, you'll need either a variable frequency or pulse induction detector for the best results. There were no recalls listed for any of the metal detectors mentioned here at the time of writing (January 2019). However, it's always a good idea to check the latest information at the Consumer Product Safety Commission website before buying any large, expensive or potentially dangerous product. Do you own any of the metal detectors mentioned here? Did you choose a different one? Let us know in the comments!